Boil the jug to get the water ready for the spaghetti (faster than bringing it to the boil). Cook the spaghetti as per the instructions on the back of the packet. 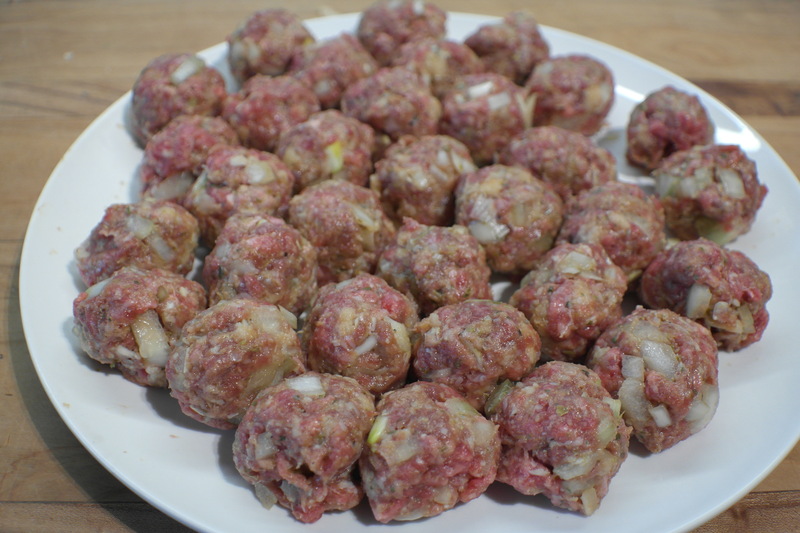 Combine all the meatball ingredients together. I use my hands. Faster. Using wet hands (so the mixture doesn’t stick) shape the mixture into balls about halfway between the size of walnuts and golf balls (!). 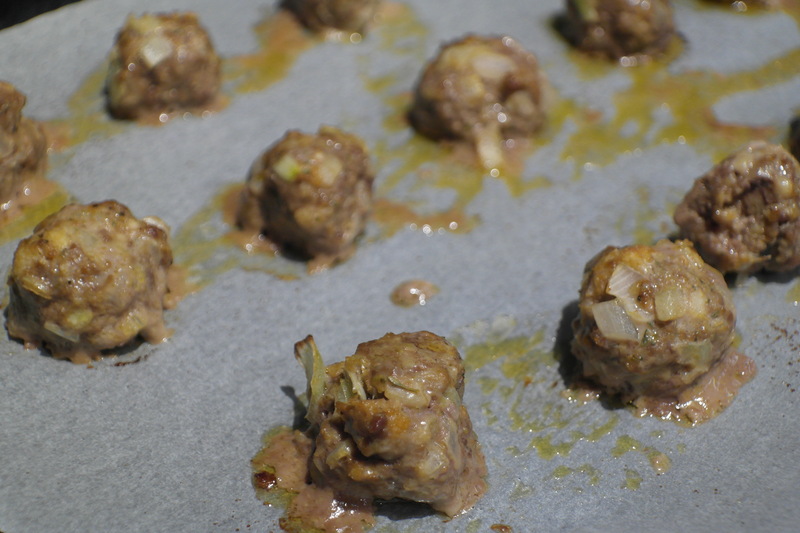 Place your balls on the baking paper/oiled roasting pan. Bake at 180 degrees for 13-15 minutes until lightly browned and cooked through. By now the spaghetti should be cooked. Drain the water and pop the spaghetti back in the saucepan and add the pasta sauce of your choice along with the spinach. Stir over a low heat until the sauce has heated through the spaghetti. 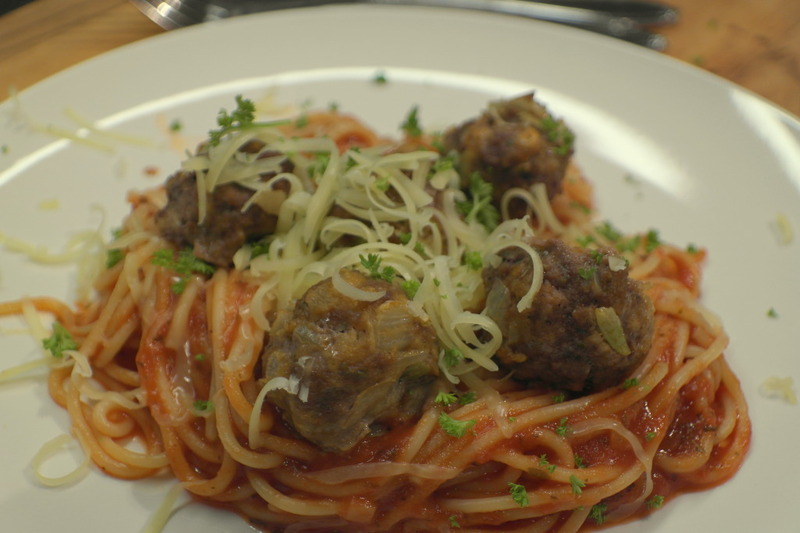 Serve up: Place the spaghetti on a plate, top with the meatballs and finish off with a sprinkle of cheese. Pop in a roasting pan, lined with baking paper (note, I only made half a batch: Kept the remainder for dinner the next night – we had stuffed pita breads with salad. Hmmm). Note, I like my onions chopped quite chunky: Can you tell? !